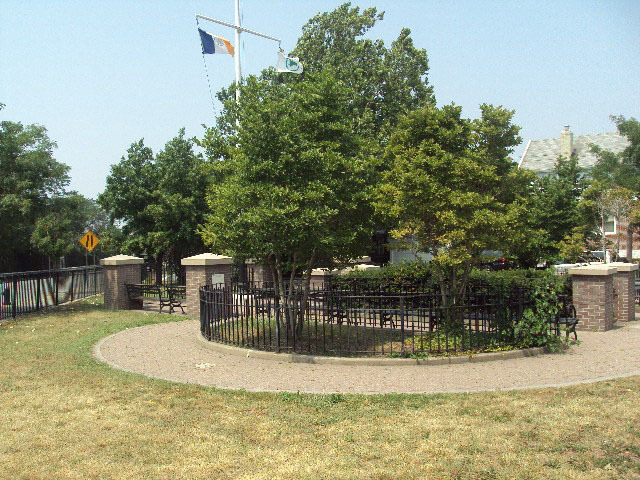 Parks Commissioner Henry J. Stern named this triangle on July 21, 1997, after nearby Borden and Jay Streets. How do Borden and Jay equal Cowbird? Think about this play on words before moving to the next paragraph. While a cowbird may sound akin to a chimera, an Ancient Greek mythological fire-breathing beast resembling a lion, goat and serpent, it is also the common name for six American birds of the blackbird family. Cowbirds are not the noblest of creatures—they tend to be nest parasites, building no nests of their own but laying their eggs in the nests of other species. While some victims of this subterfuge have learn to eject the alien eggs, most will raise the young cowbirds, often at the expense of their own smaller offspring. Cowbirds belong to the subfamily Icterinae of the family Emberizidae. This park was once named Alexander Triangle, after nearby Hamilton Place, which was named after Alexander Hamilton (1755-1804). Hamilton was born and grew up in the West Indies and moved to the Northern American colonies in 1772, where he attended King’s College, now Columbia University. He served in the Continental Army in the American Revolution, and practiced law in New York City, where he founded the Bank of New York. Hamilton also served as a member of the Continental Congress. He earned fame as the leader of the Federalist Party, and played a decisive role in the shaping of our Constitution and government policy. In 1804, Hamilton was killed by his political rival, Aaron Burr (1756-1836), in a duel in Weehawken Heights, New Jersey. In 1945, after a nine-year power struggle, Mayor Fiorello R. LaGuardia (1882-1947, Mayor 1934-1945) finally relented to Parks Commissioner and master builder Robert E. Moses (1888-1981, Parks Commissioner 1934-1960) and allowed him to take over the New York City Tunnel Authority. This consolidated the formation of Triborough Bridge and Tunnel Authority, the font of Moses’s unequalled power and influence. The Authority funded the $32.5 million construction of the Queens-Midtown Expressway, the branch of the Long Island Expressway that stretches from the Queens-Midtown Tunnel approach to Queens Boulevard. On June 28, 1972, the Long Island Expressway was finally completed, after decades of construction work. This parcel, bounded by the north side of the Queens-Midtown Expressway, Jay Avenue and Hamilton Place, was acquired in 1945 as part of the condemnation proceeding for the expressway, and the park itself opened on December 29, 1953. In 1998, Councilman Walter L. McCaffrey funded a $193,000 rehabilitation of Cowbird Triangle. Renovations included the installation of new grass, trees, benches, sidewalks, and fencing.